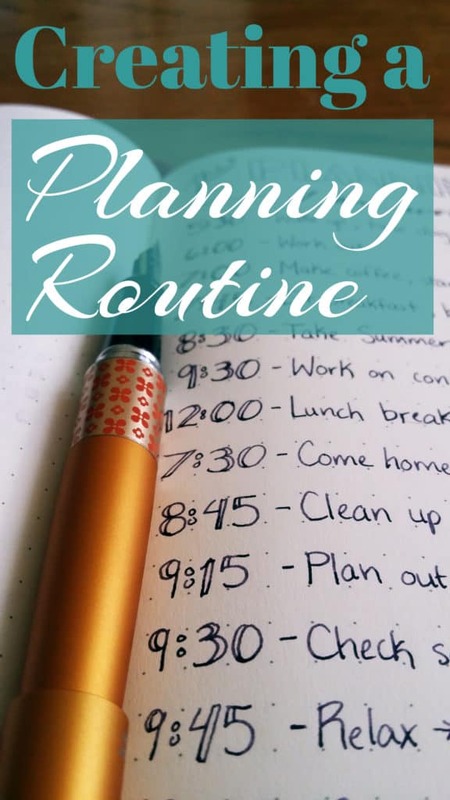 For anyone who is trying to organize their time, routines are heaven. 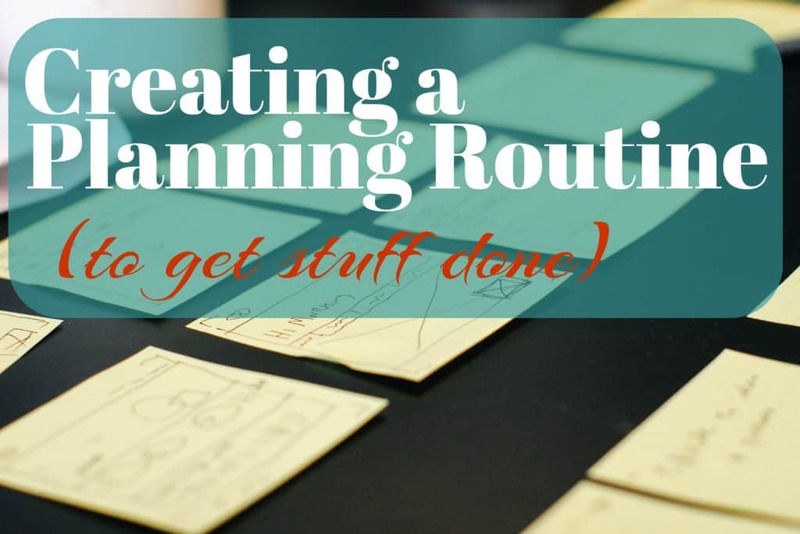 You might hear the word routine and say, “How boring!”, but hear me out. 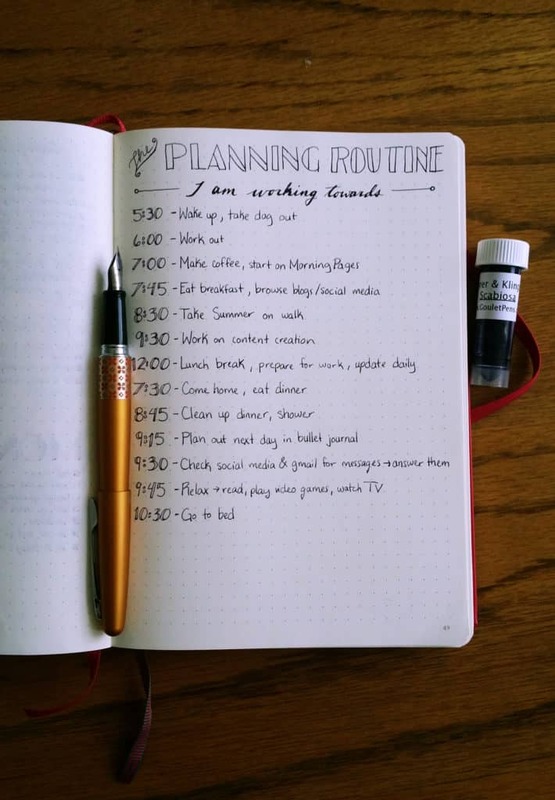 A routine is a structure in your day that allows you to get what you need done predictably and efficiently. This in turn allows you to budget your time to fit in the things you truly love, like painting or playing your favorite dystopian video game. You already have routines (like brushing your teeth before bed), but why not try to actively build one that benefits you? I am by no means happy with the current schedule I have. There are aspects that I really enjoy, like writing my Morning Pages while drinking my coffee. But I gotta admit that a decent percentage of my Morning Pages happen in the afternoon, and I don’t like that. So the page I’m showing you is not a representation of my current daily time structure, but rather, an ideal that I am striving for. I am not really a morning person. I want so badly to become a morning person, but sleepy Shelby battles these changes with Irish-blooded stubbornness. So basically, I have to trick sleepy Shelby to get started earlier. I would love to get a fancy sunrise alarm clock, but I don’t want to wake up Jon so stinkin’ early. It would be much better than a screaming alarm that startles you awake, that’s for sure. Recently, my friend and I have decided to try to meet up to exercise in the early hours of the morning, and that’s the most powerful trick I can pull. The guilt of standing up a friend ought to override the desire to stay in bed. It’s already worked once, so I’m hoping I can keep it up. It feels good to be up so early, truly! If you want to really overhaul your morning schedule, ask yourself how you currently spend your time. Do you feel good or grumpy? Do you feel rushed or relaxed? Your morning is the foundation of your whole day, so make sure you don’t neglect these first few hours. I used to wake up and only give myself the time I needed to get ready for class or work, minus five minutes. It was always stressful, I never ate breakfast, and it was a truly horrible way to start the day. I have started giving myself about an hour before an appointment to drink some coffee and feel like a person again. I would suggest you write down all your tasks and appointments before you go to bed the night before so you don’t have to collect yourself quite so much. You can glide right into whatever your first commitment is and not feel flustered. I like plotting out my tasks for the following day along with the weather in my bullet journal so I know how to dress the next day without any guessing. 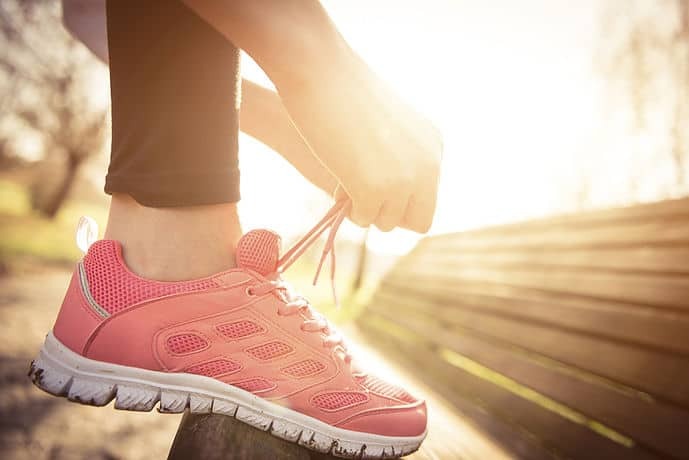 You should consider adding exercise to your morning routine. The best time to exercise is the morning. If you tackle this early on, you won’t put it off all day and ultimately neglect it. You will feel more awake and positive, and crossing this off your list will make you feel accomplished before the day has even started. I’m trying super hard to get back into doing this on a consistent schedule because it makes me feel so good about myself. You can go to the gym or stay at home. Amazon Prime has a great selection of exercise videos that you can watch for free if you are a member. You can try Prime free for 30 days (or if you’re a student you can get 6 months free) and have your pick of high intensity or gentle exercise videos to help you get started (not to mention the free two-day shipping, Prime Music, and the plethora of other membership goodies). After I work out, I want to come home and settle down with my little gold journal and Pilot Metropolitan (loaded with Rohrer & Klingner Scabiosa ink) and start my Morning Pages. If you’ve never heard of the Morning Pages, I’d suggest you read my post about how they rocked my world and The Artist’s Way by Julia Cameron to see how much this little bit of writing can help you. I know it’s helped me, especially with sorting through my busy thoughts and calming my mind. Of course, this wouldn’t be complete without a piping hot coffee to soothe my soul. I would like to eventually get a cup like this that’s MY cup, nice and large and unique. Nothing like drinking coffee out of a piece of art to prime your imagination for the day! After my Pages, I’d like to take it fairly slow and munch on a bit of breakfast while browsing my favorite blogs and social media profiles. I would get right into working, but Jon gets up around 7:30, and we always chat while he’s getting ready for work. Besides, it’s nice to relax and look at some Instagram eye candy to inspire me to get started and productive. Once Jon steps out the door at 8:30, I’d like to get ahead of Summer’s puppy energy by taking her on a walk and exhausting her. It’s pretty easy with my little treat bag and clicker to train her on how to heel (she’s getting better!). If you have a puppy, take a look at my post on How to Train your Puppy with the Bullet Journal. When I have finally taken care of myself and taken care of the puppy, I think I will be able to comfortably sit down and start plugging away at work. Too often I start work without doing things like exercise the dog, and it makes the rest of the day that much more difficult. Ask yourself what you need to complete before you feel fully ready for work? What would put you in a productive mindset? Consider adding some of these tasks to your morning routine. I want to be able to sit down for a large chunk of time and work hard to knock stuff off my list like a BOSS. Ideally, I’ll work right up until lunch before taking a short break to regroup. I usually consult my bullet journal around this time to see my progress and mentally prepare for the next tasks to tackle. My afternoon schedule changes day to day depending on whether I am doing my research job, my receptionist job, or if it’s an off day. One way or another, I want my afternoons to be one long productivity fest. What about your afternoons? Consider the work you have to do throughout your day, If you always work on X in the mornings and Y in the afternoons, why don’t you try switching things up? Our brains are better suited for certain types of tasks, like creating and brainstorming, in the morning when we are fresh. If you answer emails first thing, consider making that something that you do right before lunch or before you finish working for the day. Sometimes one little rearrange can have a dramatic effect on how productive you are. After a long day, who doesn’t love dinner? Dinner is a time when Jon and I watch whatever show we are devouring and just unwind. Currently we are involved with Boardwalk Empire,which is freakin’ incredible. Remember what I said about Prime members getting access to all kinds of goodies? This is one! You can watch this amazing HBO show free with a Prime Membership or try a 30 day free trial and see how you like it. Once dishes are dealt with, we can officially begin the evening routine. We’ll shower and be lazy for about 20-30 minutes after we are finished. While we often continue working after we bathe, it’s not hurried. I want to answer any messages I received throughout the day and sit down to plan out the next day in my bullet journal. I fill out my Habit Tracker, Gratitude Log, and update my progess bars for my goals. 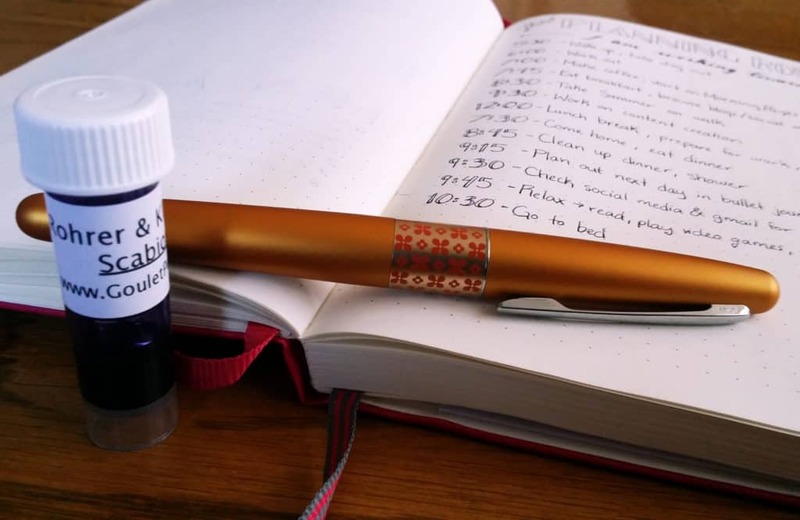 This part is key to using the bullet journal – using it every single day, preferably at night. You can see how I set up my dailies here. 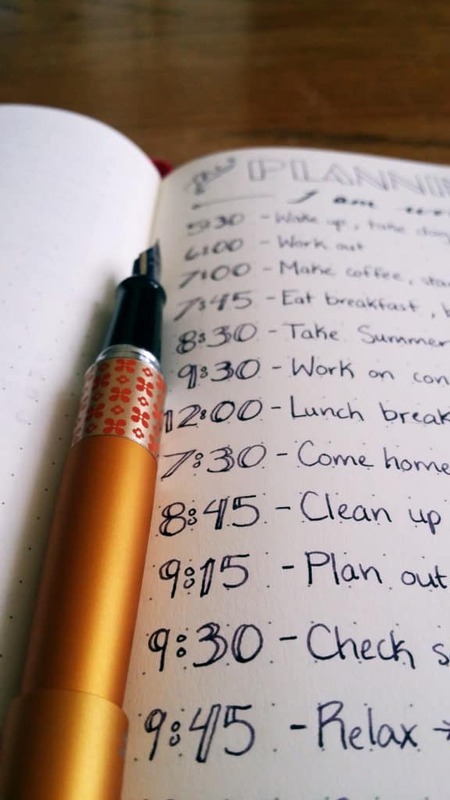 You certainly can plan for your current day, but I find it easier to get started when I already know my goals for the day when I wake up and have my coffee. Mentally prioritize your tasks or draw a numbered list of the important things in your planner. Then you can jump straight in. What do you do in your evening routine? Does it help prepare you for the next day? Don’t be afraid to relax during this time of your day, because a good night’s sleep is imperative. 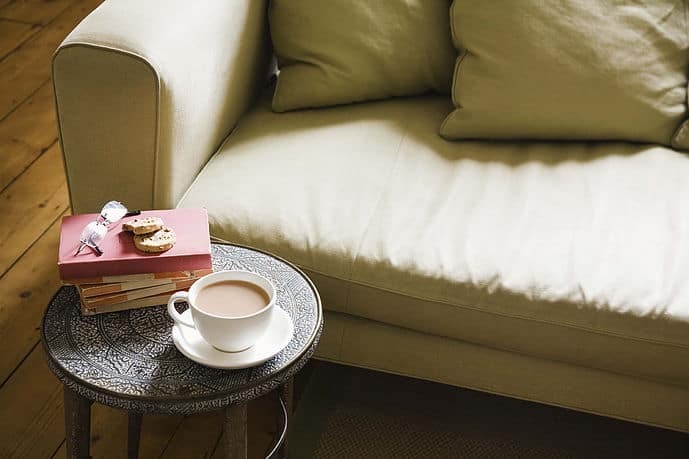 Use this time to enjoy a hobby and wind down from your busy day. You can do several little things to make the mornings easier that will take only a few minutes. For example, try picking out your outfit the night before so there’s no fuss, or pack your lunch and stick it in the fridge. Tweak your routine here and there, and you might find yourself going to sleep with a greater sense of security knowing that you got everything ready for tomorrow. Wake up, rinse, and repeat! A routine is built over time, so try new things for a few days and see if you like them. Then make an effort to inject them into your daily routine. You’ll notice the difference right away once you start designing routines instead of letting them form on their own. Once you find your jam, your whole day will be smoother and you will be in a better mood for it. So go out there and build a routine that will make your day awesome. Inspiring! I applaud your determination to start the day right with exercise. I would love to do he same but 5:30 is already my normal wake-up time, and I’m not sure I can handle getting up any earlier! Although, I do have a sunrise alarm clock, and I love it- my husband doesn’t find it too difficult to continue/go back to sleep after it goes and I get up. I’m devouring all your blog posts. You’ve inspired me to collect all my scatterbrained lists and half started notebooks into one bullet journal, and I’ve taken your suggestions in creating a master grocery list, gift tracker list, cleaning schedule, and seasonal bucket list (what a GREAT idea!). I also use a monthly spread and the dailies of course. I love having everything in one spot, and I’m so excited to develop my use of the journal. I’ve also started Morning Pages, and while it’s more of a brain dump than anything else, I’m excited to stick with it and hopefully sort out the chaos that is my mind. Thanks again for sharing all of your tips. I love your writing style, and I look forward to reading about your next creative ideas in journaling! Goodness, Joanna, I don’t blame you for not wanting to get up earlier than 5:30. I will say that I’m extremely jealous of your sunrise alarm clock. I’ve coveted one of those for years! I’m thrilled that you enjoy the blog! Bullet journaling has been so effective for me getting my life together, so I love hearing that it has helped others do the same. And the Morning Pages – I can’t sing high enough praises! Mine are exactly like yours, a braindump to just empty my noggin so I can use it for more important things. Thank you so much for reading and for leaving such a sweet comment. Have fun planning and Happy New Year! Awesome tips! If I have learned anything, it is to be flexible. I’m twenty-four and my daughter is two so we are suuuper busy every day. Ever since I started using a bullet journal, I’ve watched my life go from chaotic to productive 🙂 Definitely going to check out some of your other posts. You’re totally right, flexibility is key. And I’m sure you have to be pretty adaptable with a two year old around 🙂 thank you so much for commenting! I hope you continue to find new things that help improve your already awesome planning system!